Two women have been captured on security footage taking advantage of Narre Warren charity Bk 2 Basics Melbourne. Founder of the family-run, non-profit charity Kelly Warren was left disappointed when she noticed the ladies had taken three boxes of bottled water and half a box of Fanta. 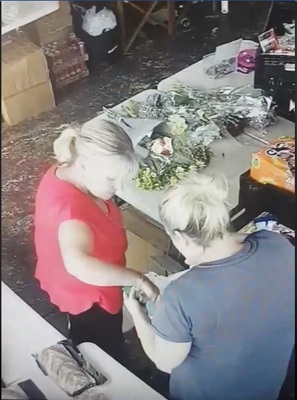 The charity took to Facebook to share the video footage of the women rummaging through boxes of donations. Bk 2 Basics Melbourne offers food every day to people that need it. People can freely take what they need, not what they want. “We do monitor what people take, but we don’t ask many people to put back because they have taken too much. 95 percent of people respect our very simple rules,” Ms Warren said. “We do not tolerate greed. Because we are open seven days a week, there is no need to be greedy. Ms Warren said those in need tend to ignore all the soft drinks, sweets etc and go straight for the fruit and vegies. The Facebook video attracted just under 900 comments and 59,000 views. In the comment section, the majority agreed that it was ‘greedy’ and ‘disgusting to see’. “It is a family-based charity and the impact of greed is just disappointing, we feel sick when the trust is broken,” she said. Together with food rescue services and businesses around Melbourne, Bk 2 Basics Melbourne are passionate about not letting anyone go hungry. “We are also passionate about our homeless family, and do regular welfare checks on our homeless community as well as feed out homeless family in the CBD fortnightly,” Ms Warren said. According to Bk 2 Basics, the boxes of water were later returned.